This past Thursday my 94-year-old mom passed away. While we are rejoicing with her arrival in heaven, we are sad to be without her here on earth. I thought this week I would share with you some of her quilts. She was a quilter, as was her mother and grandmothers and other women in the family before them. 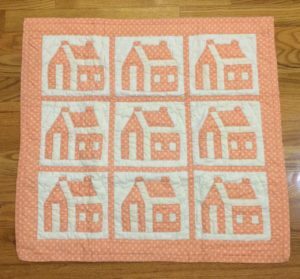 My mom loved pastel fabrics so most of her quilts were made with lighter colors like this little Houses quilt (23.25” x 22”) done in peach colored print with cream. I keep it in a charming miniature wooden trunk that my dad made for her years ago and she kept folded up doll quilts in there. 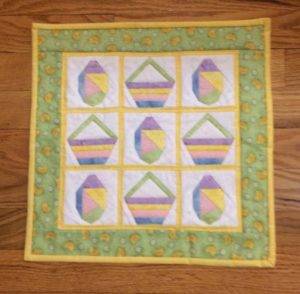 I made this cute little (13.5” x 13.5”) Easter quilt for her in 2012 in some of her favorite pastel colors. She always kept a small quilt or two pinned up on the wall and exchanged them for the different seasons. Were you around in the 1980s? Then you will remember the lovely peach and green colors that were so popular (as well as blue and mauve). 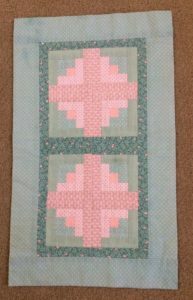 She made this little log cabin table runner to match so many other colors in her house. Personally speaking, I am glad that color era is over! But of course, I still love civil war quilts and the colors that blend with them. 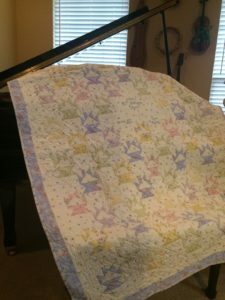 And I have to admit that I really love scrappy quilts the best – you can mix fabrics from any era and come up with something beautiful. This last quilt is a twin bed size that I made for her on her 80th birthday and it is full of pastel baskets. She loved to fold it at the foot of her bed each spring and enjoy the baskets. It is also embroidered in the middle “Happy 80th Birthday Mom”, “Love (with a heart) Phyllis”. I am so grateful that we shared a love for quilts, quilting, quilt clubs and most anything quilt related. She taught me so much about life through fabric and stitching covered in conversation. She will be dearly missed. ← Letter G News! It’s Grrrreat!